In January, Dove released a “Love Your Curls” video, an offshoot in its “Campaign For Real Beauty.” Like any mass-marketing campaign, the video is one that people either love or hate. It features a bunch of little girls criticizing their unruly curls and declaring that straight hair is more beautiful. Then, the girls are led to a surprise party, with a bunch of curly tops, dancing and singing an uptempo “we love our curls” anthem. It’s a corny, somewhat cringe-worthy scene. But, I must admit, when I was their age, I felt exactly as did these little girls. I remember the same self-consciousness, the same discontent, the same fervent wish for straight hair. Now , I see that the straight hair girls are doing the same thing in reverse, they all want to get their hand on the best curling iron, get some bouncy locks going. Children want to fit in, so it’s hard to be different or to buck conventional ideas of what’s acceptable or beautiful. But what about adults? Shouldn’t people–at some point–accept who they are? Isn’t this part of maturity, self acceptance, and the basic niyama (personal discipline) of santosha (contentment)? In my case–at some point–I stopped blow drying my hair. I discovered effective hair products and learned to work with, not against, my hair. To my surprise, when allowed to do its natural thing, my hair behaved better than when I tried to control it. Over time, my mindset flipped 360 degrees: While my hair goes crazy in humidity (I almost gave up in Pune last summer), it is part of me and I wouldn’t opt to change it. I forgot about the video until late June, when I stumbled on “Hair That’s Long, Sleek, High School Approved,” by Katherine Rosman in the New York Times. Weekly blowouts? I thought about these teens (and often their mothers, too) who pay for weekly trips to salons, trying to transform not only their hair, but their whole identities, based on factors they deem socially preferable. How many of their other decisions are similarly based on social pressure? To me, beauty (in all senses of the word) is enhanced when people accept, even emphasize, their uniqueness. It is really sad to see people pretending to be what they are not–and how long can that last? Somehow, when people embrace their own look, they are more beautiful, don’t you think? 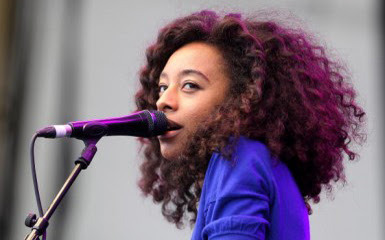 Imagine Corinne Bailey Rae without her signature hair. If she has the confidence to flaunt her curls, she must also have the self-possession to be her own person as a musician. When I was sick with a string of upper respiratory infections in spring, I kept wishing for plain, simple, normal health. If I’d had any complaints about my health before, I regretted my ungratefulness because, seriously, I’d had it good. Likewise, we’d be grateful for whatever we have, flaws and all, if we were to lose it. Coincidentally I was at a class at the weekend where curly vs straight hair was used to explain santosha! I started seeing a new hairdresser that specializes in curly hair about a year ago. Seeing her has been like therapy. I never realized how marginalized I had felt until she looked at me and said “you can have curly bangs, you know”. I teared up. Now I’m noticing how often curly hair is described as ‘wild’ and ‘uncontrollable’. I wonder what our desire to control our appearance says about us as a society, and what it implies about me as a person when people suggest I ought to be in better control of my appearance. Why are curls in need of control? It makes me wonder about how this is used to reinforce ideas about how people are treated based on how they look. Great food for thought! Thanks, babycrow and 4cats, for commenting. Regarding stereotypes about curly hair: Isn’t the heroine in the animated film Brave (Pixar) the only princess-type character with curly hair? I vaguely recall reading about academic papers written on how female protagonists don’t typically have curly hair (and, if a transformation/makeover occurs in the storyline, they go from curly to straight!). Of course, there are exceptions, from Shirley Temple to Julia Roberts in Pretty Woman to Ilana in Broad City! I didn’t mention it in my post, but the NYT article is obviously about minority girls trying to look mainstream. And aren’t the Obama daughters, now teens, now straightening their hair? Regardless of stereotypes, myths, and pop culture, my main point is the following: trying to control or to change your natural characteristics is futile and unsustainable. I definitely struggled with my curly hair as a child… so many painful sessions of my mother trying to brush it out with a conventional bristly brush… but now I wouldn’t trade it for anything! I can do whatever I want with my hair and it always looks good. Plus, my experience learning to love my wild and crazy curls has taught me to love all the other unconventionally lovely things about myself (and, by extension, about everyone else). Last summer, at your place in Bombay, I noticed some intriguing photos of your early Berkeley years: you had a cool ’60s-’70s ‘fro. Curly hair IS fun!